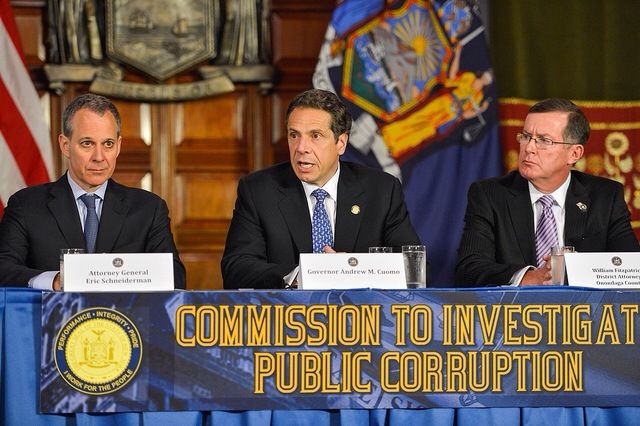 Governor Cuomo’s announcement of Moreland Commission featuring later testimony by federal prosecutor Preet Bharara, Leon Koziol and good government advocates. Remember the Moreland Commission on Public Corruption? It was created by New York Governor Andrew Cuomo in 2013 to clean up government in Albany. At least that was the case until investigations by that Commission began implicating the Governor himself along with legislative leaders like Sheldon Silver, convicted yesterday on all counts of a federal indictment. The Moreland Commission was prematurely dissolved in March of last year despite testimony by federal prosecutor Preet Bharara who commended its existence. The dissolution moved him to seize commission files resulting in the criminal prosecutions we see today. I was invited as well to give testimony before that Commission. But now serious questions linger. For example, what came of all the shocking testimony and petitions lodged by the general public, limited as it was, on Constitution Day, 2013 at Pace University? What about the hundreds of speakers excluded from that hearing who were left outside protesting as a result? Why was the Commission prematurely disbanded, and why were so many citizens misled into believing they could be heard and answered? Finally, how much corruption remains rampant here in New York State due to the utterly impotent nature of that Commission? It certainly cost our taxpayers substantial money to create this “dream team” of prosecutors and experts to root out corruption? While we certainly commend U.S. Attorney Preet Bharara for his follow-up investigations and prosecutions, a review of the public testimony raises far more concerns. It calls upon the Governor to revive his Commission if in fact the conviction of Silver is yet another wake-up call in state government. The Moreland testimony is found on our site at Leon Koziol.com. As one of the few who were allowed to participate from the general public, I raised serious issues concerning documented retaliation for my public criticisms and my complaints of judicial misconduct. The retaliation has only escalated dramatically since that hearing. If the Moreland Commission is not revived, Mr. Bharara should call for independent hearings. I am recommending the creation of a citizens Commission on Public Corruption headed by a “dream team” of good government advocates who can complete the work of the governor’s quickly dissolved entity. What happened to these speakers and their presentations? Where are they today? More to the point, what can we, the people, do to get the answers? What can we do to obtain follow-up on all the corruption which could have been heard from all those good citizens left out in the audience or in the streets? Why is all this being swept under the carpet? If we do nothing, we guarantee more of the same or worse corruption in years to come, not a very good legacy for all the children and future generations harmed by the same corruption. It’s a trillion dollar “cottage industry” as one speaker plainly put it, and it shows no sign of correction. Consequently I am asking our followers and advocates of good government everywhere to join my public requests. Contact your representatives and spread the word, make it viral as you are so good at doing, send me your credentials, suggestions and support, and let’s give this government something it never expected. An organized protest is long overdue on this critical subject. Contact me at (315) 796-4000 or leonkoziol@parentingrightsinstitute.com. You can also mail your input to my attention at P.O. Box 8302; Utica, New York 13505. Finally it must be emphasized that there are many court ordeals which warrant a book or documentary publication. As a publishing consultant, I can offer professional assistance to anyone interested in this powerful means of influencing justice and reform. You will find the details in my October 7, 2015 post here at Leon Koziol.com.